The day began as normal: get up, go to an early morning health care visit, and then head to the office for a busy day. Although I felt fairly “normal”, a colleague commented on how I didn’t really look well—not myself. The 6:30 commute home was particularly long and arduous, and by the time I pulled up to my house, I had a deep throbbing pain in my gut, right at the diaphragm, up high between my ribs. My upper back ached as well, between my shoulder blades. I took some Tylenol for my back and some Tums for my stomach, assuming it was some kind of indigestion or heart burn. Roger put food in front of me, but I had no desire to eat—food felt as if it sat still on top of my diaphragm. I was so uncomfortable that I couldn’t lie in bed with Roger and Eliza for book time. I stood next to Peanut’s bed with my elbows on the edge of her bed, in a 90-degree angle so that Baby B could hang without so much pressure on my back and right rib cage, where her toosh was constantly pushing. A long warm bath eased my pain and I was able to sleep…went to bed early, around 9:15. At midnight, I woke again with all the same pains. This time, my diaphragm hurt so bad that I woke Roger. It was a dull, deep pain, not sharp. Again, I took Tums and Tylenol and moaned. I knew it was not labor pains because there was no break—it was constant, and the pain was much too high up my back and stomach, nowhere near my uterus. As I walked upstairs to get back into the bath, Roger dialed Mairi (the midwife on call). The bath began to make me feel better, but Mairi asked that I get out of the tub, as she thought it was masking a pain that we needed to know more about. She told me to call her in 15 minutes. Sure enough, once out of the tub, the pain returned. Mairi told me that what I was describing was very unusual, and certainly not labor. She wanted me to go to the hospital to have my organ functioning tested. We would not be able to birth at home if there was anything unusual at all about my liver, kidneys, gall bladder or other organs, and she wanted blood work done as soon as possible. 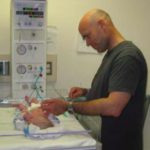 In our “we can handle it” way, Roger and I were hesitant…we didn’t want to drive all the way across town to Washington Hospital Center, and Eliza was sound asleep in her bed. We didn’t want to wake and scare her if all I had was a bad case of heartburn. I asked Mairi if I could wait until morning. She gently, but firmly, told me no; she really wanted me to get to the hospital tonight. To persuade us, she told me to go ahead and drive myself (I think she could sense our reluctance to disrupt Eliza’s life for a false alarm), and we decided to go to Georgetown Hospital, which is much closer than Washington Hospital Center, farther than Sibley, but neither the midwives nor I felt that Sibley would be very friendly to a home-birth patient. When I arrived at Georgetown, my blood pressure was already high. This immediately frightened me since I have rock-solid, steady, healthy blood-pressure levels. Never high, never low. The Resident on call informed me that my gut pain plus the high blood pressure were tell- tale signs of preeclampsia, a medical condition of unknown origin that begins suddenly and without warning (indeed, only two days prior, at my weekly prenatal visit with my midwives, my blood pressure had been completely normal), which can cause seizures, and in worst case scenarios, maternal or fetal death. I called Roger, feeling quite frightened, and also a bit shocked. Instead of panicking, I did what I always do…became very matter-of-fact about what needed to be done. I also called Mairi back, who told me she hadn’t wanted to scare me, but preeclampsia was her concern when we spoke at midnight. At 1:30 am, my blood work confirmed that my liver enzymes were high and my blood platelet’s were low; however there was no protein in my urine, so I was more likely to have skipped preeclampsia and jumped directly to a related disorder, HELLP syndrome (H – hemolysis; EL – elevated liver enzymes; LP – low platelet count). The Attending doctor—Dr. Bowles Johnson— informed me that there is only one cure for preeclampsia and HELLP: to give birth. I called Roger and told him that he needed to come to the hospital immediately. I don’t know what my voice sounded like to him, but his voice sounded shocked when he said “really? now?” Baby B was barely 37-weeks, technically “full-term” but nearly premature. He arrived with What to Expect When You’re Expecting under his arm and a small bag of stuff. We didn’t have a “hospital bag” packed partially because we weren’t expecting any action for another 3 weeks, but mostly because we had no intention of going to the hospital. I knew my birth plans were out the window. No birth alter on my third floor; no tub to help me manage the pain; no walking; no yoga positions. This would be a very different experience. 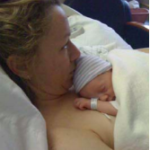 But I thought about my Birthing from Within work and the soothing voice of our instructor Susan Lucas…compassionate use of medication when necessary; being present at whatever kind of birth the universe had in store for us; this was my baby’s birth first and foremost, regardless of the medical circumstances surrounding it. I tried to coax myself to be present with Baby B.
I was moved to labor and delivery where I had my first catheter inserted by the nurse, Amy. They immediately began pitocin (medicine’s version of oxytocin) to induce labor and magnesium sulfate (a muscle relaxant often used to halt early labor) to prevent me from having seizures. The two drugs work against one another, but there really is no other choice. Roger hadn’t arrived yet, and I was frightened. My nurse Amy reminded me of my sister— bright and caring, and told me she had just had her baby at BirthCare, the birth center in Alexandria, without medication, and she warmly told me how sorry she was that my birth plans were taking a different direction. 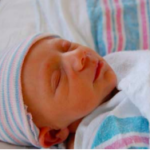 Her compassion toward a “home birth” client surprised me, but turned out to be the disposition of nearly every doctor and nurse I worked with at Georgetown (which was many!). As I worried aloud about all the pain-coping techniques I would no longer have (I wouldn’t even be allowed to stand up since the magnesium made my legs weak), she warmly but firmly told me to focus on the resource I did have—my husband, my doula, my baby, my resolve, my breath work. She told me over and over “you can do this.” And I believed her, kind of. Roger arrived around 2:00 am, after Jennifer came to our house to be with Eliza, who we decided not to wake. The next several hours are a blur. I know Roger and I talked, and Amy stayed with us nearly constantly, encouraging us, making us smile, and treating us as if we were the only people in the whole hospital. I could see Roger was scared; the line between his eyes never let up. He had been reading up on HELLP syndrome, and I think he recognized more than I did the severity of the situation. I guess I must have been scared also, though I don’t really remember it. I just remember focusing on the baby; imagining her inside me, knowing she was head down and would soon be with us. I never doubted that. The first dose of magnesium made me very sick and I threw up. Amy assured me that the initial dose was the worst (and she was right). Around 6:00 am on Friday, Dr. Bowles-Johnson broke my water at 2cm dilation to try to stimulate the labor to move a little faster. The sooner B came out, the sooner I would be out of danger. We called our doula, Claudia, to come immediately. Despite only 2-hours of sleep from attending another birth, she came without hesitation and was our constant resource for the next 14-hours, giving us stability, knowledge, encouragement and warmth. I can truly say that our situation may have ended quite differently without Claudia there with us. For the next seven hours, the doctors steadily increased my pitocin-levels, trying to speed up the contractions. I also had penicillin in my IV since I had tested positive for Group Beta Strep. And I had a blood pressure band on my left arm. I felt totally handicapped. I could lie on my back, and turn to each side, but my legs were too weak to allow me to stand or even sit on the edge of the bed. As the contractions came, and I grew more and more weary. Roger’s face showed his concern. His words were encouraging, but I could see he was scared—or nervous, or…I can’t exactly say what. I could see he felt helpless to help me. I tuned in to the Baby. With each contraction, I spoke to her, and told her what a great job she was doing. Early on in the labor, I felt almost high…my baby was going to be coming, the pain wasn’t so bad. I must have looked a little nuts to the outside observer; the magnesium made me really spacey, and I was talking quietly to the Baby. Amy left at 7:00 am, and was replaced by Maggie, a wonderful, though quiet, grandmotherly nurse who had been at it for 35+ years. Her experience gave her a solid disposition that made me feel safe and secure. She was quiet. Claudia helped answer all of our medical questions. She ran the bed pan in and out of the bathroom. She held me up to pee. She encouraged me. She stroked softly between my eyes. She told Roger to eat and sleep. When the doctors came and went, she asked them questions, interpreted their language and helped us make decisions. Since Georgetown is a teaching hospital and we were there during several shift changes, I felt like I had dozens of Residents, Attendees, medical students, and nurses throughout my stay, though Maggie and Amy live most vividly in my memory. At about 1:30 on Friday afternoon, I was exhausted, running on 4-hours of sleep, no food, and lots of drugs. The contractions were growing more painful and I was sure the end must be near. I asked for an exam to see how far dilated I was (Roger had previous requested that I have as few internal exams as possible since my water had been broken and the Baby wouldn’t be protected from any bacteria the doctors may introduce). When I heard I was barely 3 cm after 12 hours of contractions, I cried. I was so tired. I couldn’t move. It wasn’t my body’s or the Baby’s idea to give birth on this day, and my cervix seemed to be fighting the pitocin—or the magnesium was doing its job too well. I felt defeated and needed to sleep. The doctors and nurse left the room, and Claudia came to my side and gently suggested how an epidural may help me relax and sleep for a bit. Without hesitation, I asked for the epidural. The 30-minutes between asking for and receiving an epidural must be the most excruciating 30-minutes of labor. I cried, and moaned, and told Roger I couldn’t do it and how much I hurt. 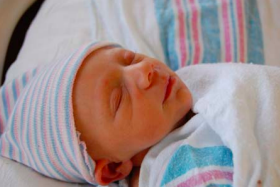 I wasn’t in touch with the Baby; I didn’t feel each contraction as a movement toward her birth but rather as stabbing pains I couldn’t control and seemed to be getting me nowhere. The epidemiologist was amazing…a confident man who was teaching a resident as he inserted the needle. It was a bit nerve-wracking to hear him say “now tap it 1mm at a time. No, stop, you did 3mm! Let me finish.” I knew that if the needle went too far into my spinal column, I would have 2-hours of pain relief and that was it. As soon as the epidural kicked in…around 2:30 in the afternoon, I fell fast asleep. I could still sense the contractions, but the pain was gone. My legs felt like elephant legs, but I could still feel them, which surprised me. I guess I expected total numbness. But I could still move from side to side with some help; I didn’t feel any less constrained than I already had from the catheter in my right arm and the blood pressure cuff on my left arm. After sleeping for several hours, I woke. I’m not sure what Roger and Claudia did during this time, or what they talked about. He’ll have to fill that in. Perhaps they slept also. We were on this journey together. Miraculously, I woke up 9cm dilated! 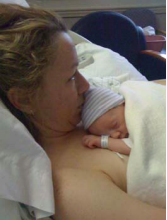 Since epidurals can slow down labor, everyone was surprised. But I wasn’t. I realized that with each previous contraction, I could feel myself closing in fear. I really needed to relax, and once I could sleep, the pitocin was able to do its job. I was elated to hear that it was almost time to push. I felt a renewed sense that we could do this. But before I could begin pushing, Claudia slipped out of the room and suddenly there was a rush of nurses and doctors and someone gave me a shot of yet another drug into my arm. B’s heart rate had dropped to 90 bpm, she had been a trooper and consistently at 130 bpm the whole time. They shut off the pitocin, and flipped me to my hands and knees (not easy with elephant legs!). I was SO comfortable in that position and with the contractions halted. I don’t know how long we stayed like that, with my tail in the air, in Child’s Pose, but I felt like I could stay forever. Slowly, my body began contractions again on its own. I must have been flipped back over at some point, though I have no memory of doing it. Then, I had the urge to push. Yes! I was shocked to discover that even with the epidural, the “urge” was still there! I was still me; Baby B was still B; Roger was still my husband; and Claudia was still my doula. An epidural didn’t really change much, but it allowed me to relax again. Pushing was hard, but rewarding. I lay on my back in “Happy Baby” pose with Claudia holding my left leg, Maggie holding my right leg, and Roger holding my hands and looking in my eyes. He didn’t look scared any more. Each time I pushed, Roger coached me on how to breathe, as if I were lifting weights—holding my breath as I pushed then hissing it out through my teeth. I got three to four pushes per contraction. The Resident, Cecelia, was happy and encouraging. She put her hands on my perineum to help me feel where to push against. Dr. Landy, the Attendee-over-all-Attendees, made occasional appearances only to be shooed away by Ceclia and Maggie. Soon, Amy came back on shift, and Maggie went home. Pushing was magical. I know that must sound incredibly weird, but it was. I felt empowered, alive, human, woman. I felt I was the only woman in the entire hospital (though I knew in my head I wasn’t), and that all these people had come just for us, just for me and Roger and B. Once B’s head emerged and didn’t go back, the doctors put on their scrubs and prepared. Claudia told me that B wouldn’t be able to come right to my chest, but would have to go the attached NICU room for immediate examination because of the magnesium, but if all was well, she’d be with me in a few minutes. With one big push—and a vomit!—B came out. Roger cut the cord and announced that indeed we had a girl. I was spent. Exhausted. 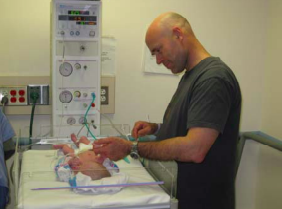 Roger went with B to the other room and I could see an overwhelming relief on his face as they performed her Apgar tests (8 at 1-minute and 9 at 5- minutes…he is sure she is bound for Harvard based on her first test scores.). She was soon on my chest and she was no longer Baby B…she was no longer the abstract toosh in my rib cage or little hiccups in my abdomen. She was Gracie. And she was beautiful. But I was cold from the magnesium, and even with warm blankets and my skin, Grace wouldn’t warm up, so they took her back under the lights (again, Claudia helped me understand each “intervention” and its medical necessity…I didn’t want her to go). I asked Roger not to leave her alone; I couldn’t stand the thought of my baby alone under a bright light. He stood next to her for 2-hours, with her little tiny hands clinging to his fingers. And he talked to her, so she had a familiar voice with her, and I watched, so in love with my husband, so happy my baby wasn’t alone. I was alive. Gracie was alive. And no one had to cut me open. I didn’t know how to thank Claudia when she left. I didn’t want her to go. I wasn’t sure I could manage without her steady, loving guidance, but given her sleep deprivation, I figured sleep was the best gratitude I could offer her. Grace nursed immediately. No troubles latching on, no confusion about what to do. We let her go to the nursery Friday night so we could get some sleep, and every time Amy came in, I made her promise me that she was checking on Grace and if Grace were crying inconsolably to bring her to me. Amy reassured me over and over that Grace was sound asleep. Gracie stayed with us in our room, and we were kept in labor and delivery for 24-hours because I had to remain on the magnesium. Every hour, the doctors checked my blood pressure, tapped my knees and elbows for reflexes, and asked me “do you have a headache? Do you have blurry vision?” They measured my urine output to make sure they weren’t giving me toxic levels of magnesium. And they drew blood every 4-hours to check my liver enzymes and blood platelets. I had compression machines on my calves to prevent clotting, and a catheter for emptying my bladder. I was almost totally immobile, yet I felt pampered, with every single need met by the doctors and nurses. Roger came and went. Running to and from the house, trying to prepare our home to be a cozy nest for me and Gracie. 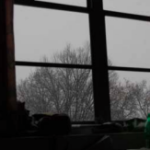 It snowed. 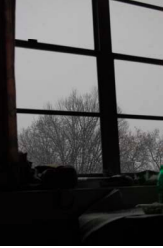 I lay quietly on the mechanical bed, with my Gracie curled up next to me, skin-to-skin, and my husband curled up on the “couch”, and I watched the snow fall through the window. The tree tops sparkled and I felt as far from Washington as could be…in another world. Immobile and on drugs and more peaceful than I can remember. The world could have been falling apart and I wouldn’t have known. My world was warm and full of Grace. The snow brought me home.